Background: Candida dubliniensis is a pathogenic Candida species which shares many phenotypic features with Candida albicans. These similarities have caused significant problems in the identification of C. dubliniensis in an average clinical mycology laboratory. Several phenotypic-based tests have been developed to distinguish C. albicans from C. dubliniensis but none has been demonstrated being sufficient alone for accurate differentiation of the two species. Aim: To facilitate the differentiation of these species, we evaluated the utility of a novel medium ‘Hypertonic Xylose Agar Medium’ (HXAM). Materials and Methods: A total of 200 Candida spp. were tested in this study which included 186 stock strains of C. albicans and 14 strains of C. dubliniensis. Identification of all these strains was confirmed by polymerase chain reaction-restriction fragment length polymorphism using Bln I (Avr II) enzyme. All isolates were inoculated on HXAM, incubated at 28°C and examined for visible growth every day up to 7 days. Results: On this medium at 28°C, all 186 C. albicans isolates showed visible growth at 48 h of incubation whereas none of the 14 C. dubliniensis isolates did so even on extending the incubation period up to 7 days. Conclusion: Hence, we propose HXAM as a sole phenotypic method for identifying C. dubliniensis from germ-tube-positive isolates or from stock collections of known C. albicans. Keywords: Candida albicans, Candida dubliniensis, hypertonic xylose agar medium, phenotypic identification, xylose assimilation. Rapid growth in clinical microbiological technologies over the past two decades has prompted laboratories to seek more efficient and cost-effective methods of identification of microorganisms in contrast to the previous labour-intensive methods requiring several days. With the emergence of new pathogens, especially the drug-resistant ones, it has also become necessary that the available diagnostic tools be constantly modified to keep abreast with the ever-changing spectrum of pathogens. Candida dubliniensis is a fungal pathogen whose clinical significance seems to be its association with immunocompromised individuals and its ability to rapidly develop a stable fluconazole-resistant phenotype on exposure to this antifungal in vitro. C. dubliniensis have been overlooked and misidentified for a long time. 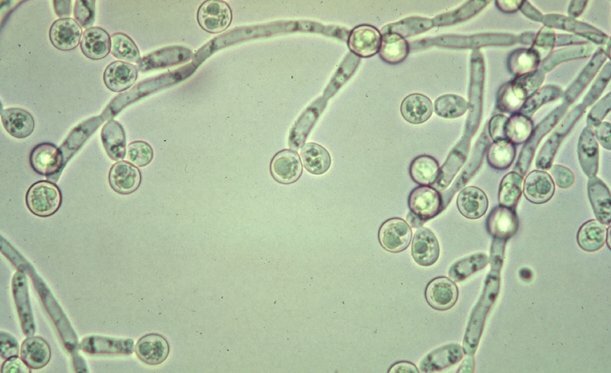 This is because C. dubliniensis and its close relative Candida albicans share many features in common such as microscopic morphology and ability to form germ tubes in serum, production of blastoconidia with pseudohyphae, true hyphae and chlamydospores used routinely by average clinical mycology laboratory to identify C. albicans. Several phenotypic-based tests have been developed to distinguish C. albicans from C. dubliniensis: the absence of growth at 42°C and 45°C, characteristic rough-looking colonies and chlamydospores on STAIBagar, initial dark green colonies on CHROMagar Candida, non-fluorescent colonies on methyl-blue Sabouraud agar, turquoise smooth colonies on Candida ID agar, colony morphology on other differential media such as niger seed agar, simplified sunflower seed agar or tobacco agar, reduction of tetrazolium salts, absence of beta glucosidase activity, antigenic differences with C. albicans by indirect immunofluorescence, physiological assimilation tests and coaggregation with Fusobacterium nucleatum. In multiple publications, variable success using each of these methods has been reported and all have been demonstrated insufficient alone for accurate differentiation of the two species. To circumvent these difficulties, various molecular methods have been developed, polymerase chain reaction (PCR) being the ‘gold standard. However, these tests are not readily applicable for the identification of this species in most average mycology laboratories. Nevertheless, the concept of a reliable routine isolation medium that could be used instead of PCR in differentiation of the two species remains attractive. 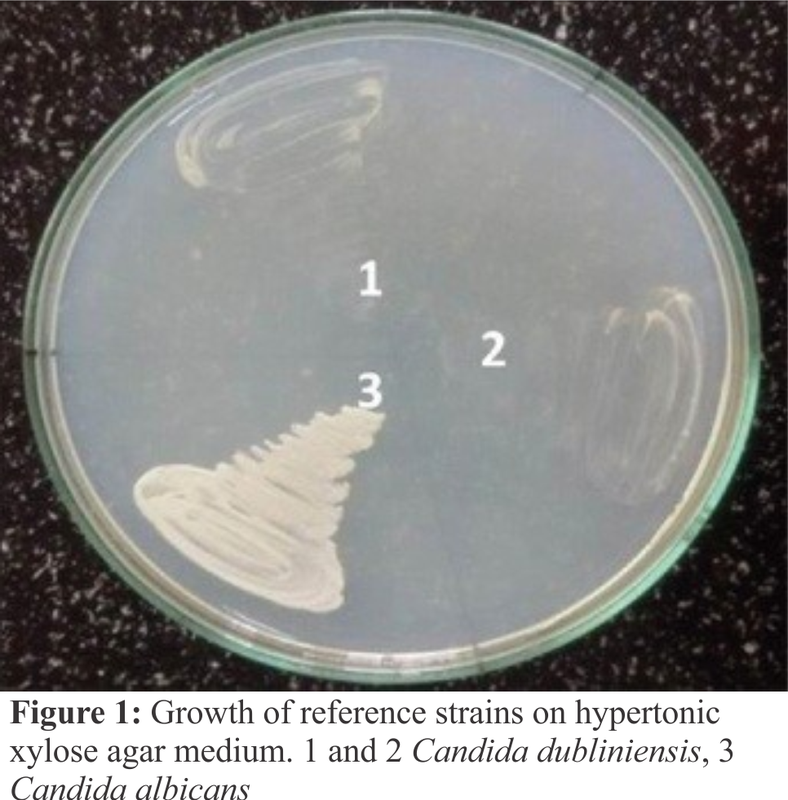 In the present study, the authors evaluated a new medium ‘hypertonic xylose agar medium’ (HXAM) for isolation and identification of C. dubliniensis and differentiation of this yeast from most other Candida spp. on the basis of growth on this medium. This study was conducted in the Mycology Division of Department of Microbiology of a tertiary care hospital in Kashmir, India. The study was approved by the Institute’s Ethics Committee. A total of 200 Candida spp. were tested in this study. These included 186 stock strains of C. albicans tentatively identified by phenotypic methods such as germ tube formation, colony colour on HiCrome Candida differential agar (HiMedia) and characteristic morphology on corn meal agar. These were isolated from cancer patients with oral candidiasis/colonization and held in stock collection of Mycology Laboratory, Department of Microbiology, SKIMS, Srinagar. Remaining 14 isolates were strains of C. dubliniensis which were kindly provided by Dr. Ziauddin Khan (Professor and Chairman Department of Microbiology, Kuwait University). Identification of all these strains was confirmed by PCR-restriction fragment length polymorphism (PCR-RFLP) using Bln I (Avr II) enzyme which produced two strong bands of 200 bp and 340 bp in C. dubliniensis and only one band of 540 bp in C. albicans. C. albicans 90028 obtained from National Culture Collection of Pathogenic Fungi, Department of Medical Microbiology, PGIMER, Chandigarh and C. dubliniensis (type strain CD36) and C. dubliniensis (CBS 7987) which were kindly provided by Dr. Ziauddin Khan (Professor and Chairman Department of Microbiology, Kuwait University) were included in the study. HXAM was prepared by suspending 10 g of xylose powder in 900 ml distilled water. To this 20 g of agar and 65 g of NaCl was added and the solution was heated to dissolve the medium completely. The medium was sterilized by autoclaving at 15 lbs pressure (121°C) for 15 min. After cooling to 50°C, 100 ml of yeast nitrogen base solution was added and mixed thoroughly. The medium was poured in sterile Petri dish More Detailses (20 ml in each 90 mm) and allowed to dry. Final pH of 6.3 ± 0.2 was maintained at 25°C. Colonies from a 24 h culture on Sabouraud agar plates were suspended in sterile distilled water adjusting to 0.5 McFarland standard. One loop full of each suspension was inoculated on HXAM which was then incubated at 28°C and examined for visible growth every day up to 7 days. none of the 14 C. dubliniensis test isolates and the reference strains ‘C. dubliniensis (type strain CD36) and C. dubliniensis (CBS 7987)’ showed any growth on this medium at 28°C even on extending the incubation period up to 7 days [Figure 1] and [Figure 2]. These observations were reproducible when experiments were repeated on three different occasions. C. albicans assimilates xylose while C. dubliniensis does not. Gales et al. and Pincus et al. in 1999, Gutiérrez et al. in 2002 and Loreto et al. in 2010 used this property to differentiate C. albicans from C. dubliniensis. Various carbohydrate assimilation systems (Vitek 2, API 20C AUX, ID 32 C, Micronault-Candida) are available for the identification of these two species but different investigators have reported variable results for each of them. The usefulness of xylose assimilation in discriminating C. dubliniensis from C. albicans has also been evaluated by conventional assimilation method using xylose disc as well as by incorporating this carbon source into a carbon-free solid medium. The latter was done by Khan et al. in 2012, who proposed that this test should be performed on germ tube-positive Candida isolates only as Candida glabrata also does not grow on this medium. About 5% of C. dubliniensis isolates assimilate xylose and could be falsely identified as C. albicans as reported by Pincus et al. Hence, if used alone there is the possibility that a small number of C. dubliniensis isolates will be missed. Furthermore, some isolates of C. albicans do not assimilate xylose and could be falsely labelled as C. dubliniensis. Differences in the regulation of specific stress genes have been observed between C. albicans and C. dubliniensis. In particular, ENA21 gene, encoding a sodium ion transporter, is strongly induced in C. albicans but not in C. dubliniensis. This difference of salt tolerance has been used by Alves et al. in 2002, Chowdhary et al. and Ells et al. in 2011 to discriminate between the two species. Salt tolerance of the strains was first measured using hypertonic Sabouraud broth by Alves et al. and salt in YEPD agar by Cassone et al., but these methods did not reveal clear-cut and easily interpretable results. Furthermore, high percentage of false-positive results (11.4%) using hypertonic Sabouraud broth were reported by Silveira-Gomes et al. in 2011. Akgül and Cerikçio?lu in 2009 used modified agar-based medium which showed good results. Keeping in view the results of salt tolerance test and xylose assimilation, we devised a novel medium ‘HXAM’ by incorporating xylose into a carbon-free hypertonic solid medium. In our study, we found that all C. albicans showed visible growth on this medium at 48 h of incubation while none of the C. dubliniensis was able to grow on this medium. By this method, we can test both salt tolerance and xylose assimilation on a single medium increasing accuracy, decreasing cost, saving time and manpower. C. glabrata being non-osmotolerant and not able to assimilate xylose  may be mistakenly identified as C. dubliniensis on this medium. This can be overcome by performing the test on germ-tube-positive isolates only. We observed that, as compared to other methods, HXAM is a simple in-house, fast and easy to perform test saving time of technical staff. It is also less expensive (1.5 INR per isolate) since as many as eight isolates can be tested on a single plate and the extent of growth is assessed by the naked eye. Hence, we propose HXAM as a sole phenotypic method for identifying C. dubliniensis from germ-tube-positive isolates or from stock collections of known C. albicans. As overall prevalence of C. dubliniensis is very low compared to other species of Candida in clinical laboratories, adoption of expensive, time consuming and labour intensive methods such as PCR-RFLP for its routine identification method that is 100% accurate, simple and easy to perform without consuming much time of the technical staff in addition to being cost effective. The authors thank Sher-i-Kashmir Institute of Medical Sciences, Soura, Srinagar, for funding the project. Authors thank National Culture Collection of Pathogenic Fungi (NCCPF), Department of Medical Microbiology, PGIMER, Chandigarh and Dr. Ziauddin Khan, Professor and Chairman Department of Microbiology, Kuwait University, for providing control strains for the project. 1. Kantarcioglu AS, Yücel A. The presence of fluconazole-resistant Candida dubliniensis strains among Candida albicans isolates from immunocompromised or otherwise debilitated HIV-negative Turkish patients. Rev Iberoam Micol 2002;19:44-8. 2. Ellepola AN, Khan ZU. Rapid differentiation of Candida dubliniensis from Candida albicans by early D-xylose assimilation. Med Princ Pract 2012;21:375-8. 3. Gutiérrez J, Morales P, González MA, Quindós G. Candida dubliniensis, a new fungal pathogen. J Basic Microbiol 2002;42:207-27. 4. Khan ZU, Ahmad S, Mokaddas E, Chandy R. Tobacco agar, a new medium for differentiating Candida dubliniensis from Candida albicans. J Clin Microbiol 2004;42:4796-8. 5. Akgül O, Cerikçio?lu N. Hypertonic Sabouraud dextrose agar as a substrate for differentiation of Candida dubliniensis. Mycopathologia 2009;167:357-9. 6. Jan A, Bashir G, Fomda BA, Fatima A, Lone MA, Roohi S. Molecular Identification of Candida dubliniensis among Candida albicans isolated from oral cavity of cancer patients using PCR-RFLP, in a tertiary care hospital in Kashmir, India. Br Microbiol Res J 2016;14:1-7. 7. Mirhendi H, Makimura K, Zomorodian K, Maeda N, Ohshima T, Yamaguchi H, et al. Differentiation of Candida albicans and Candida dubliniensis using a single-enzyme PCR-RFLP method. Jpn J Infect Dis 2005;58:235-7. 8. 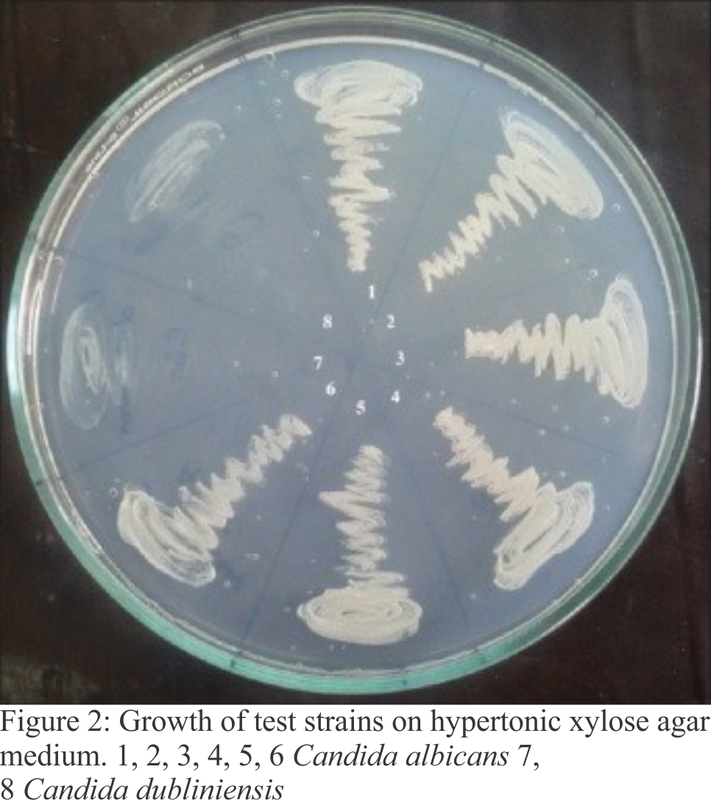 Khan Z, Ahmad S, Chandy R, Joseph L. A simple xylose-based agar medium for the differentiation of Candida dubliniensis and Candida albicans. Diagn Microbiol Infect Dis 2012;72:285-7. 9. Gales AC, Pfaller MA, Houston AK, Joly S, Sullivan DJ, Coleman DC, et al. Identification of Candida dubliniensis based on temperature and utilization of xylose and alpha-methyl-D-glucoside as determined with the API 20C AUX and vitek YBC systems. J Clin Microbiol 1999;37:3804-8. 10. Pincus DH, Coleman DC, Pruitt WR, Padhye AA, Salkin IF, Geimer M, et al. Rapid identification of Candida dubliniensis with commercial yeast identification systems. J Clin Microbiol 1999;37:3533-9. 11. Loreto ES, Scheid LA, Nogueira CW, Zeni G, Santurio JM, Alves SH, et al. Candida dubliniensis: Epidemiology and phenotypic methods for identification. Mycopathologia 2010;169:431-43. 12. Betty AF, Sahm DF, Weissfeld AS. Bailey and Scott’s Diagnostic Microbiology. 11th ed. Philadelphia: Mosby Publications; 2004. p. 927-38. 13. Enjalbert B, Moran GP, Vaughan C, Yeomans T, Maccallum DM, Quinn J, et al. Genome-wide gene expression profiling and a forward genetic screen show that differential expression of the sodium ion transporter Ena21 contributes to the differential tolerance of Candida albicans and Candida dubliniensis to osmotic stress. Mol Microbiol 2009;72:216-28. 14. Alves SH, Milan EP, de Laet Sant’Ana P, Oliveira LO, Santurio JM, Colombo AL, et al. Hypertonic Sabouraud broth as a simple and powerful test for Candida dubliniensis screening. Diagn Microbiol Infect Dis 2002;43:85-6. 15. Chowdhary A, Randhawa HS, Kowshik T, Kathuria S, Roy P, Brandt ME, et al. Application of hypertonic Sabouraud glucose agar for differentiation of Candida dubliniensis from Candida albicans. Diagn Microbiol Infect Dis 2011;69:440-2. 16. Ells R, Kock JL, Pohl CH. Candida albicans or Candida dubliniensis? Mycoses 2011;54:1-6. 17. Silveira-Gomes F, Sarmento DN, Espírito-Santo EP, Souza Nde O, Pinto TM, Marques-da-Silva SH, et al. Differentiation between Candida albicans and Candida dubliniensis using hypertonic Sabouraud broth and tobacco agar. Rev Soc Bras Med Trop 2011;44:457-60. Candida albicansCandida dubliniensishypertonic xylose agar mediumphenotypic identificationxylose assimilation.